PriceTurtle is another clone of PriceExpert, PriceRocker, PriceWagon, and other identical advertising-supported programs that have started floating around on the Internet recently. You should remove PriceTurtle from your PC because it is not that interested in providing you with the best online shopping deals. Instead, the aim of this app is to promote third-party advertisement content. Despite how useful it might seem, even if you do engage in online shopping a lot, PriceTurtle is just another generic adware program possessing the same characteristics other apps of this type have. Therefore, if you do not want your web surfing activities continuously challenged by the pop-ups or banners PriceTurtle sends to your browser, take the necessary steps to delete this program from your machine. If you want to keep PriceTurtle on your system, you will need to put up with the increased amount of the third-party commercial content on your screen. Especially annoying is the pop-up window that opens when your look for the items on online retailer sites (Amazon, Ebay, etc.). 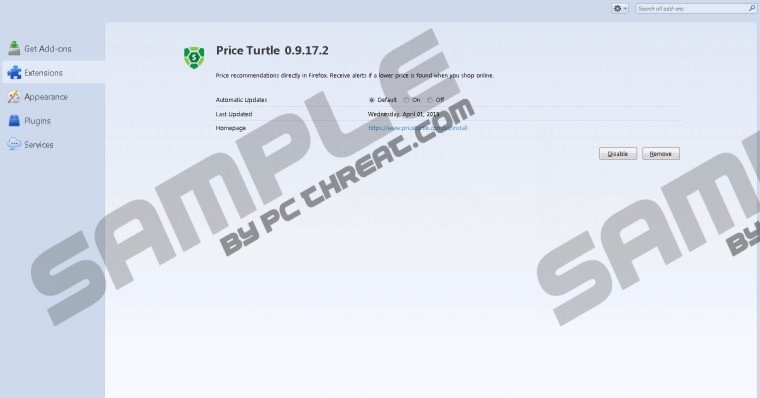 The biggest concern regarding such adware programs as PriceTurtle is their ability to be hijacked by additional malicious programs entering target systems. It has been noticed that clicking on the promoted third-party links might redirect users to sites swarming with malicious threats. Thus, the surest way to remove the possibility of infecting your computer via this inconsistent advertising content is to delete PriceTurtle from your system once and for all. This adware app is also known to record information about sites visited, products checked out, things looked on the Internet. Officially, this kind of surveillance helps adware programs to serve computer users the best content possible. However, we never recommend allowing these apps to collect any information regarding you and your computer. You should remove PriceTurtle due to the possibility that the recorded data might reach third-parties who might have ulterior motives regarding this kind of information. PriceTurtle works on such popular browsers as Internet Explorer, Mozilla Firefox, and Google Chrome, where it manifests itself as an browser add-on. If you want to delete this adware app, you might need to terminate it from Control Panel. Bear in mind that, even if you follow through the instructions we have provided below, PriceTurtle might still leave leftover files or registry entries that could negatively affect your PC or even eventually restore this adware app. Acquire a tested and trusted antimalware scanner that will automatically remove all the possible remains after the manual removal of PriceTurtle. Open the Charm bar at the right bottom corner of your screen. Find PriceTurtle in the program list and click Uninstall. Find PriceTurtle in the list and click Uninstall. Quick & tested solution for PriceTurtle removal.